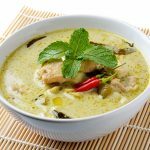 I love this green chicken curry recipe, it's easy, has a nice "kick" to it from the chilies and it's delicious, especially when you have a bowl of boiled long grain rice with it.Note: You can change the number of people served by placing your cursor over "Servings". The Ingredients will adjust to the new number of servings. Cut the chicken into bite sized pieces. In a wok or large skillet over medium high heat, add in the 2 tablespoons of oil and the chicken and cook, stirring, for about 3 or 4 minutes. Add the coconut milk, garlic and fish sauce and bring to a boil. Lower heat and simmer gently for 30 minutes or until the chicken is tender. Remove the chicken from the mixture with a slotted spoon and set aside and keep warm. Stir the green curry paste into the pan, then add the chilies and lime leaves and simmer for 5 minutes. Return the chicken to the pan and bring to a boil. Adjust the seasoning to taste with salt and pepper, then stir in the cilantro. If you can't find kaffir lime leaves, you can simply substitute lime zest to get a wonderful fresh lime scent and citrus flavor that adds zing and freshness to your dish. A regular "everyday" Persian lime, like the kind you find at grocery stores, will do just fine. Better yet, use a combination of lime and lemon zest. Generally, about 1 and 1/2 teaspoons of finely chopped lime zest can be used in place of one kaffir lime leaf. Try one teaspoon of lime zest and 1/2 teaspoon of lemon zest, and then adjust to your taste.